At the risk of asking a stupid question: Would Amargasaurus have been able to hold its neck upright like you’ve proposed as general for sauropods? Would those high neural spines have not gotten in the way? Biologist, but no paleontologist here. First impression: neck spines are not the only extensions of the spinal column. I also see spines along the back and descending spines along the tail. To me this suggests a bluff strategy: with tissues (even thin tissues) on the spines, the critter would have looked far bigger than its central core when it presented itself side-on to a predator (or competitor!). Think of how mammals and birds fluff-up when threatened. Christopher, why would you think that’s a stupid question? Seems to that you’re absolutely right: if the reconstructed vertebrae in the mount and the Salgado et al. figure are anything like correct, then the spines would have dramatically limited dorsal flexibility of the neck. I wonder whether it’s possible that each vert’s spines could slip neatly past the next vert’s, on the outside? Probably not, actually, looking at Salgado and Bonaparte’s (1991) figures 5 and 6 of Amargasaurus cervicals in anterior view. On the other hand, their figure 13 (skeletal reconstruction) does show the neck in a more or less Vidal-compliant posture without any spines overlapping. I guess it’s going to be impossible to tell without seeing the material. Phil Mannion is ‘doing’ S. America soon: we could beg him to take a close look. Phil? Amphibians seem to be the only group that have gone in for this skin-piercing thing (there are also frogs that, Wolverine-style, unsheath their claw-like unguals by actually piercing through the epidermis). Pottos don’t do it, and were amargasaurs agile enough to use their spines as actual weapons? We don’t know. The best known animals with ‘protruding’ bones are of course deer. Whether they’re at all relevant here I don’t know. Are there any hints on the bone surface of the spines which would give an indication how they were covered? I am no expert about this, but shouldn´t there be differences between a bone surface which was covered with skin and a bone surface which was mainly the base for a ceratinous horn or even musculature and sinews? Oh, and are there any indications for healed fractures of the spines? And yes, deer are well known for protuding bones, so well known that most people never realize how bloody freakish deers actually are, especially given the fact that they regrow their antlers every year. I know this is completely out of context, but as I blogged about this just I short time ago, I just could not resist to mention it. OK, the “Spanish ribbed newt” (Pleurodeles waltl?) is officially awesome, despite not being a sauropod. X-man Wolverine needs to change his name. I notice A.‘s neck is conspicuously lacking ventral spines. That allows room for the Freyan air bladders. I wonder if the function of the spines is really just to break up A‘s outline. If so, that would argue against integumentary stripes on diplodocids, because if they could manage stripes, they would be way cheaper than spines. It would also argue against sails, and say something about its feeding environment — tall grass? I am with djlactin. Horses manage with erect hairs on their manes to bluff their size (cheap!). I used to work with wall lizards (Podarcis), usually a very dorsoventrally flattened lizard. I was very impressed how, when males displayed to each other, their raised themselves on their legs and flattened their bodies laterally, and arched their necks to look really impressive! A good person to look at the spines of _A.cazaui_, would be Tobin Heironymous. He recently finished his Ph.D dissertation on osteological correlates for integument (skin, keratin etc.). I bet he could figure out if there was some kind of epidermal covering on those suckers. I am not sure if these spines were robust enough to deter the angry theropod. 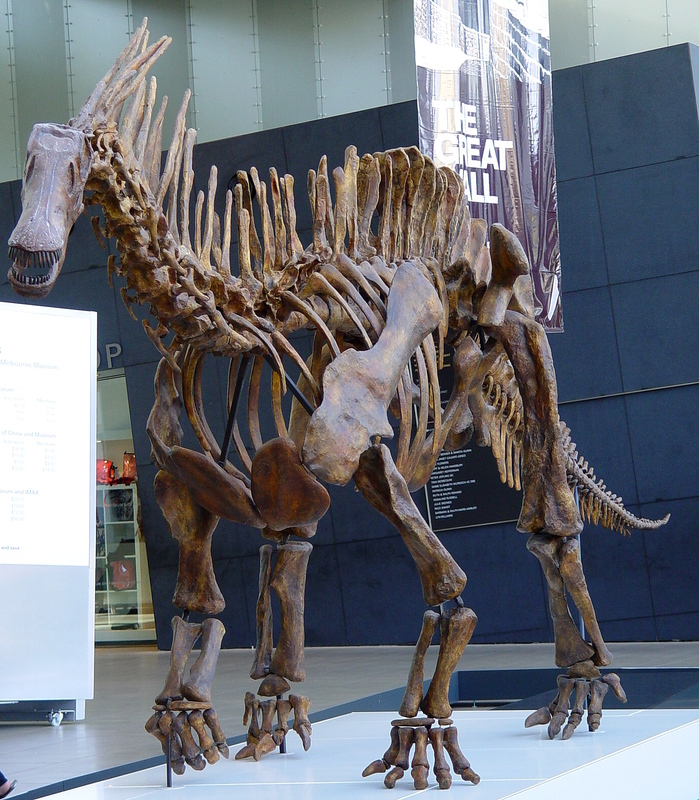 For the best effect, Amargasaurus would have to almost tuck its head between forelegs, then spines would point forward. But giraffe bulls are known to fight by swinging necks and hitting with their short horns. Watch youtube to see how powerful it is – other bull is really pushed away by the impact. Now, imagine Amargasaurus doing the same, puncturing the rival with the row of spines! This hypothesis is testable – look for neck mobility and eventual puncture woulds! Additionally, the spines could be (partly) covered with the skin, froming the mega-display larger than the soft-tissue crests, which other diplodocids are known to possess. “flexed cervico-dorsal junction”. Is that a typo? The cervico-dorsal looks extended to me. If I’m wrong, I need these terms defined, please. Yes, Rob, the cervico-dorsal junction in the mounted skeleton is indeed slightly extended. I think the point Darren was making is that it is less extended than we would expect to see if Amargasaurus behaved like extant animals (but then maybe it didn’t). For necks, extended means raised and flexed means lowered. I admit that it took me a long time to get the hang of this, and that I prefer Stevens and Parrish’s more explicit terms “dorsiflexed” and “ventriflexed”. The way I got it was to think of the neck as being like a giant knee sticking out the front of the animal. Then flex and extend mean what you think they do. Am I all alone in finding the notion of these spines as weaponry absurd? They’re too easily snapped off, and if not snapped off, attached to vertebrae easily crushed instead. Well, how easily snapped off are they? Analogous vegetation perhaps (whatever that might be), but not grass; Amargasaurus is not much younger than the oldest known flowering plants, and some 40 Ma older than the oldest known grasses. They don’t look easily snapped off to me; Just ’cause somthing is thin doesn’t mean it is “easily snapped off”. We must remember that the spines are solid bone, aand were probably also sheathed in keratin. Pottos being closely related to lorises, which have venom in their inner elbows that they lick before biting, might indicate some possible toxicity potential against predators (raptors, leopards) which grasp/bite the neck/throat area. Do pottos have skin glands (or cysts) around the covered cervical spines? Did amargasaurus have venomous kin? They also point the wrong way. Presumably, laminae extanding up the anterior, posterior and lateral margins of the spines are indicated of laminar sheets, muscle insertion or origin regions and/or regions occupied by pneumatic diverticulae. If so, these regions at least would not be spinous in any fashion. In this case, it would apear that the basal 1/5 of the forked neural spines were not projecting beyond the tissues of the neck as spikes. Qilong: PLEASE REPEAT IN ENGLISH. They point the right way when the neck is curved down. I think the most likely answer for these spines is some sort of display — possibly defensive, more likely for mating/courtship displays. However, the side-by-side of the potto and the sauropod neck triggered a wild’n’crazy thought: it looks like a perfect defense against an attack from above. I also recall that some large birds of prey will drop on prey from above and bite through the spinal cord, killing or paralyzing the prey. Is it possible that Amargasaurus had to deal with large predatory pterosaurs or birds that made a practice of dropping from above and striking at the vulnerable neck? Seems like Witmer could do an investigation of soft-tissue correlates for Amargasaurus–he just did it for centrosaurine ceratopsids. My question is more from the perspective of a paleo-artist. The cervical spines originate from bifuricated cervical neural spines, and the dorsal neurals are also bifuricated. The sacral spines are NOT, though, and neither are the caudals. I’ve never been comfortable with the “sail-back” idea because wouldn’t the sail also extend along the dorsals? And they’d just stop at the pelvis? That just looks bad, conceptually. I’m more in favor of a big wall of meat to the level of the dorsal neurals, and keratin coverings on the cervicals above that point. I doubt a pterosaur or bird would even think of attacking such a large animal as Amargasaurus. But I always thought theropods would try to attack the neck of sauropods to bring them down… the spines would be a great way of preventing a large theropod from getting a good hold of the Amargasaurus neck. The comments above about poison, newts and lorises raise a fascinating question in my mind. Is it possible that there were poison glands in whatever kind of covering the spines had, or around them? Would this probably make the animal too dangerous in both ends (I’m assuming Amargasaurus had a whip-like tail as is often reconstructed but I don´t know if this is known for certain)? In nature, “expensive” structures such as these spines are seldom used for one thing alone. I’m sure there is more to these spines than meets the eye. They were probably useful to Amargasaurus in more than one way. Bailey (1997) suggested these were basically the only dinosaurian neural spines to actually resemble those of sailed sphenacodonts and lizards, so was a proponent of the dual sail idea. I have to wonder though- is there any evidence Dimetrodon and such actually had sails, and if so is Amargasaurus different in these respects? My mistake on the “Vidal-” comment. However, my use of “normal” comes from the contrast preferred between ONP and this erect posture, and the characterization in Naish et al (2009 SVP abstract) that erectile posture is comparable in habitual posture (without a description of percent of time spent in any given posture) and the attribution that ONP refers to feeding posture. Osteological posture whould be normative unless the desire is to depict an organism in an super-active state (alert or attentive, running while alert, etc.) while passive behaviors on the like of sleeping, many feeding postures, typically involve relaxation of posture and a horizontal or depressed orientation of the forward body. So the characterization of “normal” (“active” in the paper) is meant to provoke discussion on the missing aspect on the repeatedly mentioned paper (percentiles of posture in living animals). Poisonous sauropods… what an awesome idea. Pity there’s probably no way to tell. Jaime, I think you should re-read Taylor et al. (2009) :-). We make the point, repeatedly, that it’s NOT the case that “Osteological posture whould be normative unless the desire is to depict an organism in an super-active state” (which is what Stevens and Parrish have been assuming). In fact, osteological neutral posture tells you literally nothing at all about how an animal habitually holds it neck. Nothing. Bailey (1997) also seems to think that a certain giant predatory dinosaur walked around with an enormous hump of fat on it’s back, simply because the elongated neural spines are broader front-back than those of pelycosaurs… and he comepletely ignores (or perhaps is simply unaware of) the fact that sail-backed chameleons do not posess thin pelycosaur-like rods – they have “buffalo-like” broad neural spines, just as in Spinosaurus and Ouranosaurus. Fallowing Bailey’s advice, I shall go and inform those chameleons that they should have humps rather than sails, and that they are breaking Bailey’s Law. So… I’m saying that, with all due respect to Jack Bailey, I wouldn’t take his paper too seriously. And to Qilong: Please see Daniella Perea’s comment. Your comments seem to be written in some kind of foreign languange and do a complete fly-by. I have a possibly dumb question: Could that tail, which certainly looks like it would have been surprisingly tall and flat, have been used to propel Amargasaurus while it swam/walked in shallow water? I checked Wikip on the La Amarga Formation, and the fact that the various described members all had bodies of water encourages me in this (otherwise uninformed) speculation. A (partially) aquatic lifestyle might suggest other possible uses for neck spines/a neck sail. That’s quite the non sequitur- you don’t believe Bailey was right about the plate-like spines of Spinosaurus being withers, thus he was wrong about the cylindrical spines of Amargasaurus being sails? I think people’s dismissive opinions are mostly due to people misunderstanding what kind of structure he proposes. It’s not a fatty hump like a camel’s hump, but rather a narrow tapered muscular ridge. After an excruciatingly long debate about this with Jaime years back on the DML, my conclusion was that the distinction between muscular ridges and skin sails is probably not all-or-nothing, and that Spinosaurus might have had a thinner ridge than Acrocanthosaurus for instance (due to its lack of transverse dorsal expansion and general transverse thinness). There are lots of good reasons for thinking that sauropods as a group were primarily terrestrial (although, like elephants there’s no reason to think they didn’t spend some time in water the opportunity arose). But Sauropoda is big, diverse, disparate and long-lived clade. It seems pretty unlikely to me that among a couple of hundred species (that we know about) living on every continent across a hundred and fifty million years, there weren’t some that adopted a more strongly aquatic lifestyle. There are specific anatomical features that correlate well with that lifestyle, e.g. broad rather than slablike chest, wide feet; as far as I know, there’s no reason to think that Amargasaurus had any of these, but then I’ve not seen the material. If the skeletal in the original description of Amargosaurus is correct, then Amargosaurus apparently did have a VERY tall, laterally compressed tail (not that this automatically makes it a swimmer, mind you, but it is suggestive). The body actually does seem very broad compared to, say, Nigersaurus. Almost hippopotamus-like, although perhaps I’m going a bit too far there. The manus, incidentally, also looks pretty wide. Of course, skeletal mounts are often innaccurate, and I am certainly not saying that this mount is really anything to go by. I’ve always been intrigued by the idea of Amargasaurus and even Stegosaurs shaking their necks and tails to make loud clattering sound with their plates and spines, kinda like Dark Age soldiers ( and even riot police)to intimidate the enemy. The potto does not use these structures for defense or display, but they are part of a very sensitive tactile zone according to “Nuchal adaptations in Perodicticus potto” by Alan Walker (1970).